We’d love your help. Let us know what’s wrong with this preview of It Came from Beneath the Sink! by R.L. Stine. To ask other readers questions about It Came from Beneath the Sink!, please sign up. #30 "It's warm! It's breathing! And it doesn't do dishes!" Something is lurking under the sink in Kat's new house. Something her nightmares are made of. Something dark and scary... What can it be? This one was great! One of the first ones I read, and re-read several times. Perfectly creepy and definitely had me double-checking all the cupboards in the house for a little while. Definitely one of the better books of the series. And it made me wish that I had never opened that cabinet, never reached under the sink, and never found the spongy... thing. Because now it was too late. Too late for us all. This book is severely creepy. I was creeped out by it as a child and I still am upon this re-reading. Kat and her little brother Daniel move to a new house. There, they discover something under the kitchen sink. Something that looks like an old, dry brown sponge. But they soon notice that it is warm. And pulsing. And has beady And it made me wish that I had never opened that cabinet, never reached under the sink, and never found the spongy... thing. Kat and her little brother Daniel move to a new house. There, they discover something under the kitchen sink. Something that looks like an old, dry brown sponge. But they soon notice that it is warm. And pulsing. And has beady little eyes. And people start getting hurt - their dad falls off a ladder, Daniel's friend steps on a nail, etc. It turns out that the sponge is a Grool - a bad luck charm that brings pain and misery to whoever "owns" it. However, you cannot give away the Grool (or throw it away) or you will die in 24 hours. And even though they try their hardest to destroy it (running over it with their bikes, throwing it in the garbage disposal, burying it in the backyard) the Grool always snaps back. Can they ever get this evil thing out of their lives? Dark, creepy, sinister - this is one of the scarier Goosebumps novels (even though the premise sounds ridiculous). I would put it right up there with the Living Dummy Subset in scariness levels. P.S. The dog, a cocker spaniel, is named Killer. A evil sponge? Well this is what this story is about. It is about a sponge that is found in the sink of the house. What this sponge does is that it causes bad luck for anyone that has possession of it. The owner of the sponge cant throw it out or else she will die in a day. This sponge laughs as the owner gets all these curses and things coming their way. Eventually the sponge dies when you reverse the effect. If you can't kill it by hatred why not make the sponge not like you anymore. So Kat the A evil sponge? Well this is what this story is about. It is about a sponge that is found in the sink of the house. What this sponge does is that it causes bad luck for anyone that has possession of it. The owner of the sponge cant throw it out or else she will die in a day. This sponge laughs as the owner gets all these curses and things coming their way. Eventually the sponge dies when you reverse the effect. If you can't kill it by hatred why not make the sponge not like you anymore. So Kat the main character gives love to the sponge and eventually it dies and changes color. All the other bad things that happen eventually reverses and everything is back to normal. and that is how this melodramatic 90’s treasure begins. i’ll admit, this is definitely not my favorite goosebumps book, nor do i think it’s one of the better ones, but the premise was certainly extremely entertaining. a freaking sponge. that lives under the sink. and causes bad luck to all it comes across. it takes kat and daniel a little while to figure out what’s going on, but once they start to realize the truth, they do some research and act quickly. encyclopedias? libraries? THOSE WERE THE DAYS. that’s it i’m building a time machine. i’ll be in the 90’s. 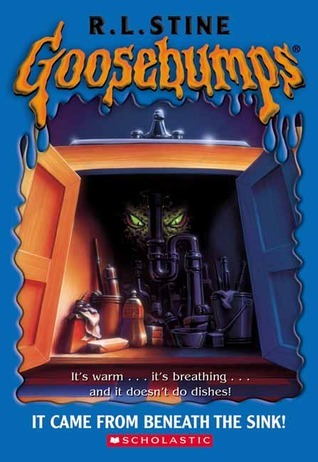 This was another Goosebumps book that was released in the U.K. around the same time as the TV episode, I always instantly think of that version first. It’s a fun playful entry in this series, you can tell Stine loves he’s 1950’s ‘B Movies’. Surprisingly a story about an evil sponge like ‘Grool’ is highly entertaining. Feeding from people’s bad luck is such a great concept. The strengths of this book come from introducing the antagonist pretty early on, so there's the entire book's length available to develop it, and the fact that it is not trying to harm the protagonists directly, but rather through means of bad luck. Unfortunately the book then falls on many other aspects: a lot of the events seem to be recycled from previous Goosebumps, so much that in the first chapter I was starting to wonder if I had picked up Welcome to Dead House by mistake. The adults ignor The strengths of this book come from introducing the antagonist pretty early on, so there's the entire book's length available to develop it, and the fact that it is not trying to harm the protagonists directly, but rather through means of bad luck. Unfortunately the book then falls on many other aspects: a lot of the events seem to be recycled from previous Goosebumps, so much that in the first chapter I was starting to wonder if I had picked up Welcome to Dead House by mistake. The adults ignoring completely the children are back as usual, but that kind of behaviour has to be accepted: stories where children fight monsters would rarely be possible otherwise. The classic attempt at getting rid of the inanimate object, so it will be able to somehow find its way back, is present twice. In general the characters aren't very interesting. I don't know how to react to the ending. One part of me wants to like because it was hinted on in the first half of the book, but the rest of me hates it for how silly it was. Another book from my childhood. I was dusting up my book shelf and this book caught my attention, again! In the end, I stopped dusting and got distracted with this book for an hour (I always get distracted with books whenever dusting up my book shelf :D). Yes it took me an hour to finish reading this book. This is the 30th Goosebumps series by R. L. Stine (he was my only favourite author during my childhood). It's about an evil sponge (imagine the evil version of Spongebob Squarepants! :D) found Another book from my childhood. I was dusting up my book shelf and this book caught my attention, again! In the end, I stopped dusting and got distracted with this book for an hour (I always get distracted with books whenever dusting up my book shelf :D). Yes it took me an hour to finish reading this book. This is the 30th Goosebumps series by R. L. Stine (he was my only favourite author during my childhood). It's about an evil sponge (imagine the evil version of Spongebob Squarepants! :D) found under the sink by Katrina Merton. The book cover is misleading, makes you think that there's monster under the sink. But it's just a sponge (evil one). The story starts with Katrina Merton (Kat) and her brother Daniel Merton moved to a new house. While Kat is cleaning under the sink, she and her brother find the sponge that is alive complete with a set of evil looking eyes. Bad luck follows where ever they go and with each accident, the creature becomes more excited and alive. You should read this book to find out what happens next. When I was in third grade this was one of my FAVORITE Goosebumps, well I hadnt read it in a few years so I decided to read it, it is about a sponge that is in a house that Kat had JUST moved into. Well, the sponge caused bad luck, and they foung out it was really called a Grool. And whoever found it had to keep it or else they would die within one day, so they kept it, and they tried to kill it, but it would just form back into one piece. So finally they killed it by giving it love not hate, be When I was in third grade this was one of my FAVORITE Goosebumps, well I hadnt read it in a few years so I decided to read it, it is about a sponge that is in a house that Kat had JUST moved into. Not a bad book, but not one of my favourites. I wouldn't have expected a story about an evil sponge to be scary but there were some pretty creepy moments. The ending was fairly predictable though. Recommended for young readers or anyone who doesn't mind a light, easy read...and a bit of nostalgic cheesiness! Si gli do 4 stelline perché l'ho letto come se fossi una bambina. Un po' rimpiango di non aver letto queste storie quando ero piccola perché sono sicura che mi sarei innamorata della lettura e anche delle storie. Stine scrive bene e alla storia non manca niente anche se non è composta da centinai di pagine. Non ci sono momenti morti. Katty who is also known as Kat to family found something under the sink but it brings bad luck to its owner but can Kat figure out a way to get rid of the thing or will she be filled up with bad luck for the rest of her life. I like this book because it has a mythical creature and suspense. Kat and her bro, daniel, moved into a new house, they felt very luck. but that was about to run out. Because something evil is living in their new house. something that is moving, watching, and waiting. There were a few things the characters did that either didn't make sense to me, or felt like they were done only to move the plot in the direction the author wanted it to go in. But other than that, this was another great addition to the Goosebumbps series. I loved the Goosebumps series when I was a kid!! I read every one -- several times!!! There's still a lot of love for this franchise and deservedly so. Yes it's silly, yes it's corny, yes it's kid's stuff. Still, I read the whole thing with a grin on my face. It's wonderful.